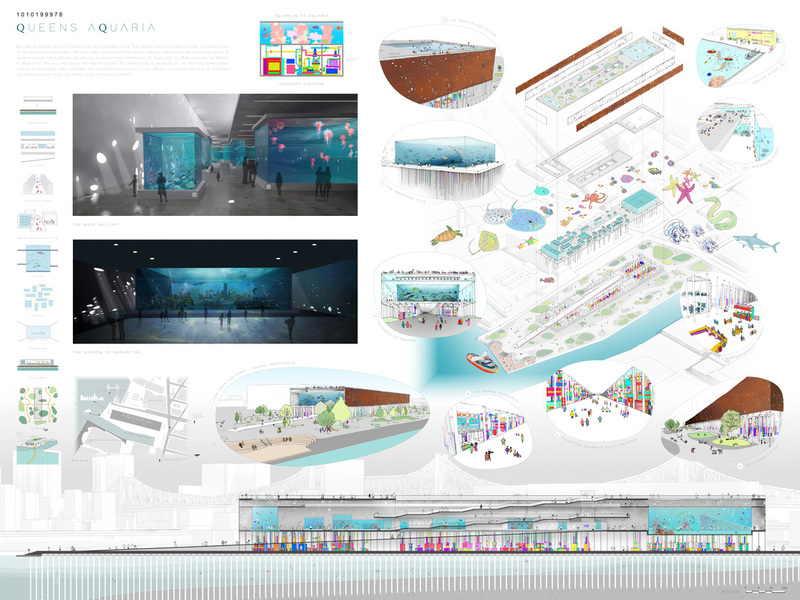 The design idea is the communication of integrating the aquarium and park through intertwining experiences featuring five exhibits and an Aquatic Garden. 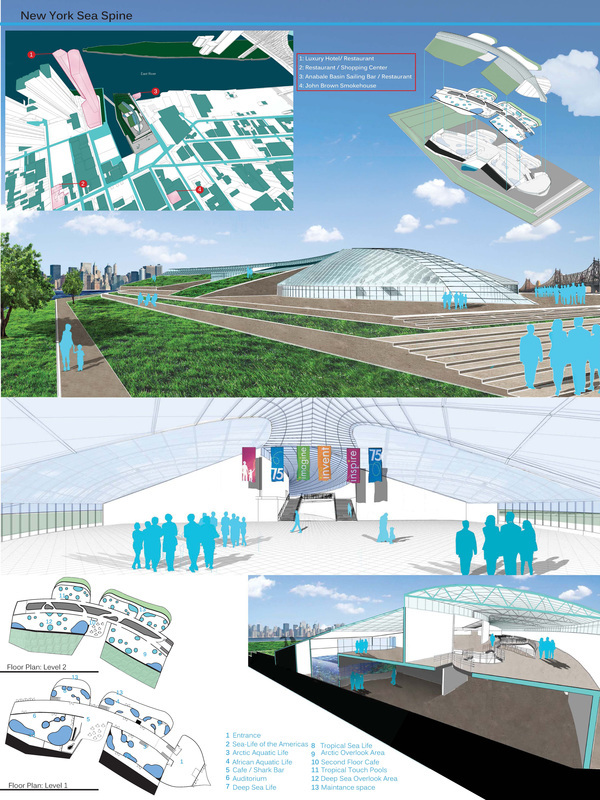 The strategy for sequential spaces is a veiling and unveiling of areas as one moves through the building and park. The paths will lead one to grand reveals along the way climaxing with the view of the Manhattan seascape. The aquarium has four levels with the top floor for servicing of tanks, an area on all floors for the development of research of aquatic life, classrooms for additional aquatic education, and a restaurant for the waterfront visitors and local community. Each exhibit has its own unique approach, and are all easily accessible from the ground level. Welcome to Aquariauaria! Just a 15 minute ferry ride from Manhattan! 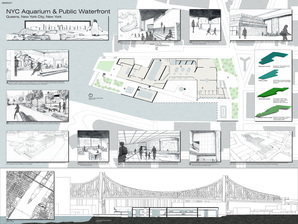 The journey starts by passing through the amphitheater to the waterfront food market. 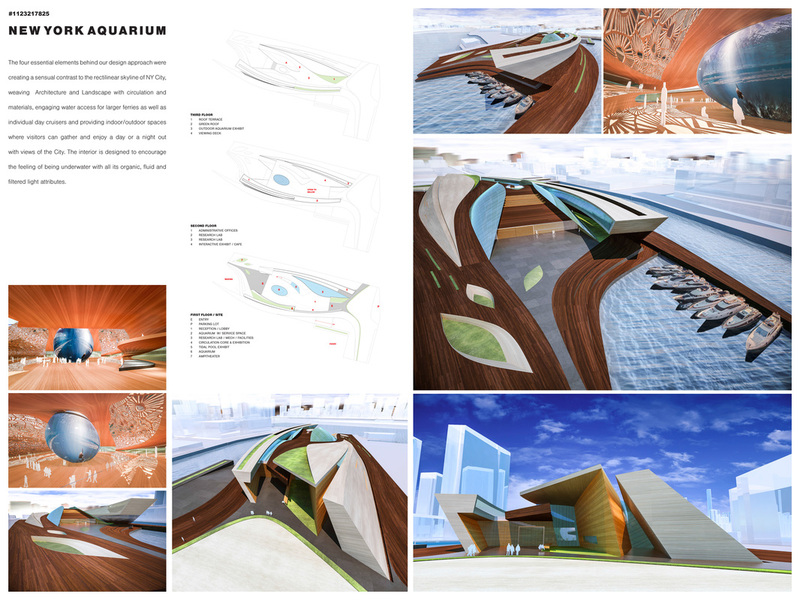 An entry ramp leads you past the marine research laboratories and an exciting display of aquarium systems. 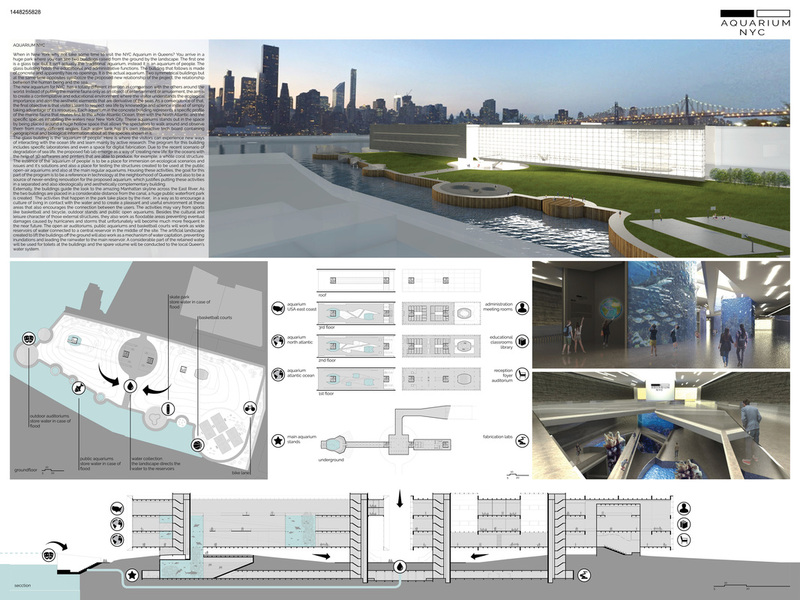 Upon entering Aquariauaria , you encounter three experiences : the Cave tank, the Maze tanks and the Window to Manhattan . You will then reach the rooftop garden . 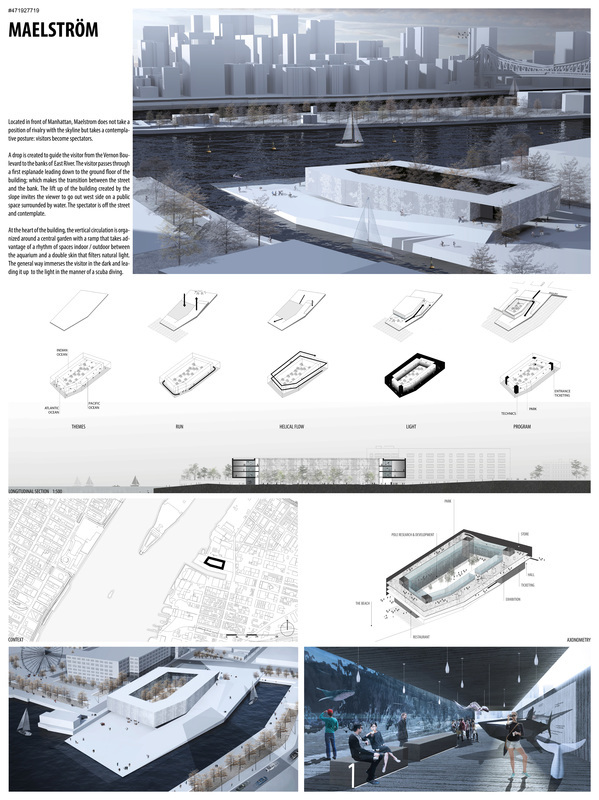 The architecture is influenced by the industrial surroundings, through its rectilinear form, colonnade and weathered corten steel façade. Aquariauaria challenges new new ways of perceiving the aquarium, where tanks and service space are equally exposed. 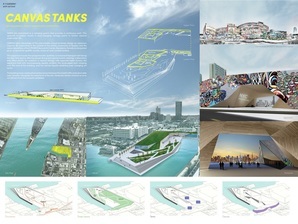 TANKS are centralized to a ramping system that provides a continuous path. This upwards circulation results in ever-changing vantage points to further observe underwater life. 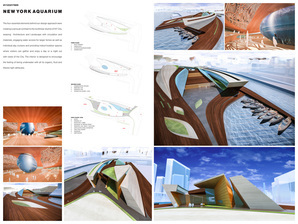 CANVAS takes advantage of the unavoidable closed-envelope design an aquarium requires. By responding to the context of the artistic community of Queens and the recent demolition of the 5 POINTZ Aerosol Art Center, the exterior facade is interpreted as an art board for graffiti, murals, street art and curated exhibits. 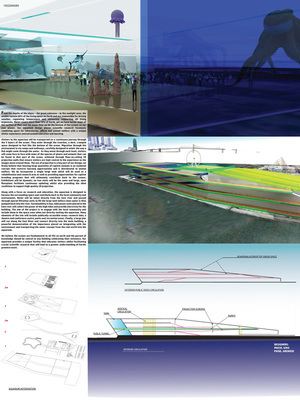 The four essential elements behind our design approach were, creating a sensual contrast to the rectilinear skyline of NY City, weaving Architecture and Landscape with circulation and materials, engaging water access for larger ferries as well as individual day cruisers and providing indoor/outdoor spaces where visitors can gather and enjoy a day or a night out with views of the City. The interior is designed to encourage the feeling of being underwater with all its organic, fluid and filtered light attributes. 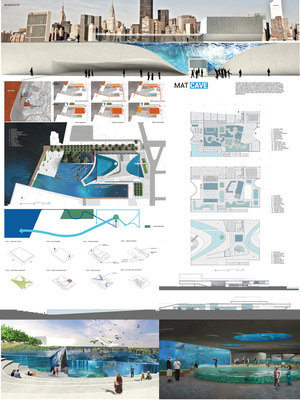 The design of this aquarium is in the shape of two stingrays with their fins spread wide opened coming out to surface. 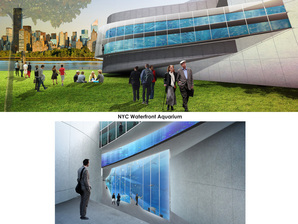 The aquarium is located underneath the park although other parts are above ground for the viewers enjoyment. The water tanks of the aquarium are separated by species, focusing on the life of the Atlantic Ocean, which is the closet to New York. The main view besides water life is the view of Manhattan across the river, which can be seen all across the park. Your body emerges in the hall within the crowd. With the ticket in your hands, the trip can be-gin. You are going down the stairs, feeling the mist invading your face, you are instinctively following the light of the aquarium that clarifies more and more as you approach. Now you find yourself in the cold current. You continue your experience as the basins appear one after the other like lanterns in the city. Following the current, you are ascending the gentle slope heading to the warm basins. You are immersing into subaqueous life, as you see your body reflected in the glass of the aquarium above you, leaving not limits to your imagination. The Mat Cave intents to reactivate the eleventh street basin and adjacent waterfront through an innovative approach in developing an aquarium and its site on an abandoned pier. 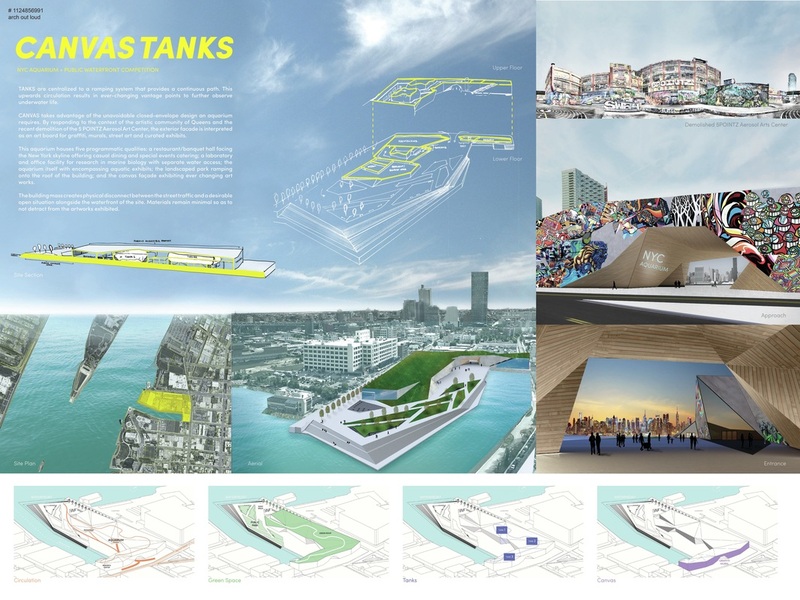 It is important to recognize that this is an opportunity to hinge reinvestment to activate the intersection of Queens and Brooklyn by providing strategic park, amusement, retail and open space systems. This given priority, will draw street activity from surrounding city into the historical commercial/industrial District. 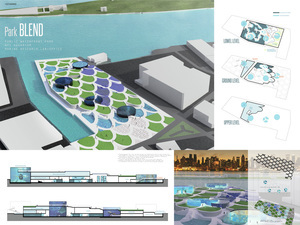 The design concept is based on using the building and site to connect various hubs of activity to the river and surrounding neighborhoods. ​The Living Breathing Aquarium is based on how a fish takes in water through the mouth and filters through the body to leave the gills. Visitors enter through a concentrated point and filter into the zones of the aquarium either side of the central space. Circulation is fluid as is the flow of water; visitors are gradually directed to an exit opposite the entrance to reveal the Central Recreation Park and views across the river. The restaurant is left until last in the journey through the aquarium, from this point the visitor can take in views of the surrounding landscape and adjacent Warm Water Tank. The project consists in two symmetrical buildings but at the same time opposites. 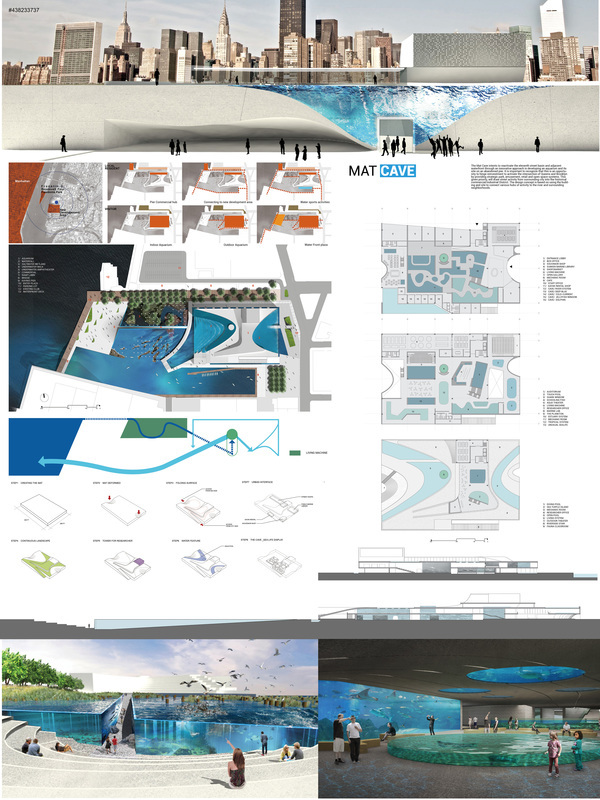 A glass building that holds the educational and administrative program, the aquarium of people. And a concrete building apparently without openings, the actual aquarium. Instead of putting the marine fauna only as an object of entertainment or amusement, the aim is to create a contemplative and educational environment where the visitor understands the ecological importance and also the aesthetic elements that are derivative of the seas. 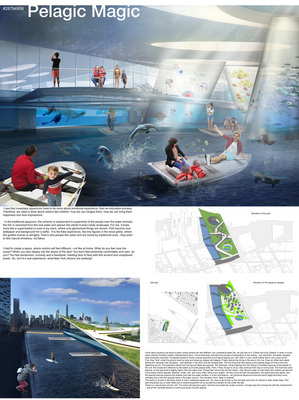 ﻿The Waterfront Aquarium takes advantage of the siting with a full panoramic view created by two intersecting volumes. 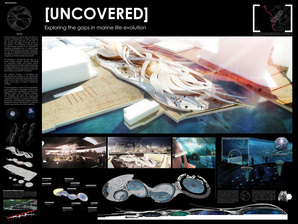 The reaction yields a central aquarium viewing exhibit in the central of the space, which sets the datum for circulation with a series of concentric ramps offering changing views to surrounding marine exhibits. 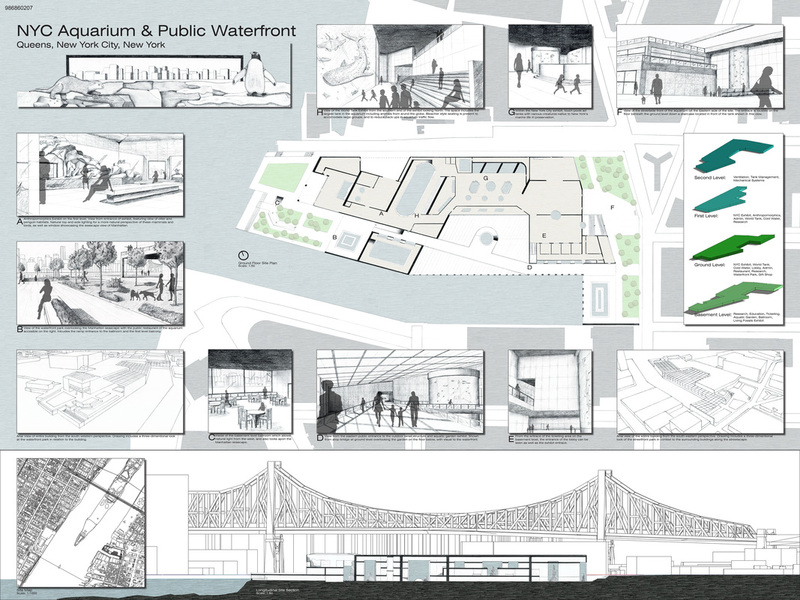 The exterior public space features wide open areas with circulation that take cues from the form of the building, and offer an unobstructed connection to the East River and the skyline of New York City. 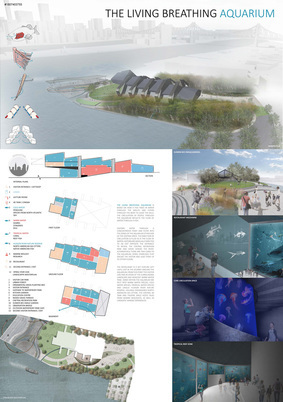 In the traditional aquarium, the scheme is subservient to superiority of the people over the water animals: the fish is extracted from the real water and placed into sterile human-made landscape. Sometimes it looks more like supermarket, and It is the fake experience. I tried to create a space, where visitors will feel different. What do you feel near the ocean? When you dive deeply into the abyss of the sea? You feel excitement, curiosity and a heartbeat, meeting face to face with this unexplored power. So, isn’t it a real experience, what New York citizens are seeking? In New York City, everything goes fast: work, subway, and people… TAKE A BREATH! This project is about taking time to stop, enjoying the short moments of life. And we want to create a new space for meeting, to know each other. ​The site is a perfect place to do that. The park is composed by the themes of vegetation and water: community gardens, promenade and filter basins to enjoy the hot summer days. The aquarium is coming out of the ground with a central atrium to join each part. Only two goals: HAVE FUN AND LEARN! Exhibiting the full story of marine life is a huge challenge, since most of the main links in the tree of life, has gone extinct eons ago, the aquarium brings back those ancestors in direct relation with the modern underwater biodiversity. The Aquarium will play a huge role in providing an educative facility and public space that seeks to raise awareness on the state of marine life as well as the state of water pollution in the east river, through using a system of precolation filters using earth, the system will purify the water and make it useable in the display tanks. 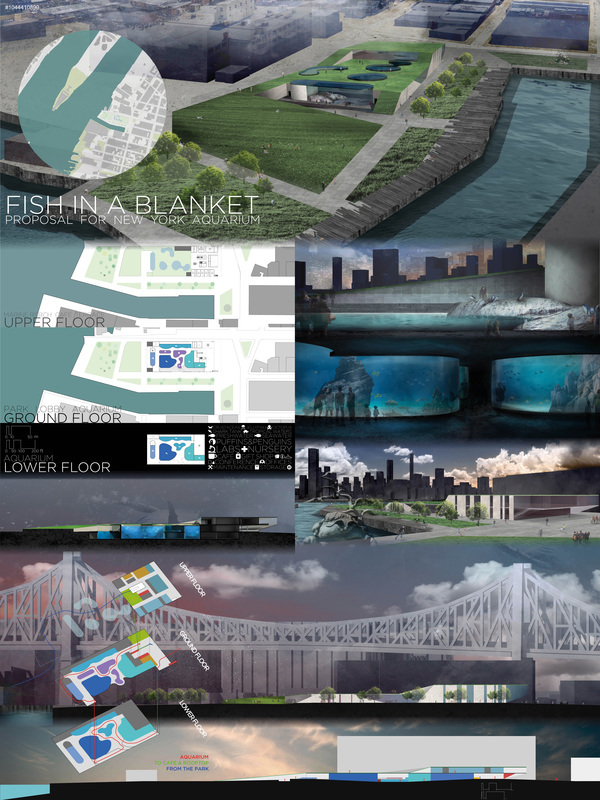 Situated between the river and the quickly (re-)developing area of Long Island City, Park BLEND will take root in its neighborhood and create a buffer zone for the public. The building is designed to inject the surrounding natural and built components, and harmonize them; water, greens, glazing and hardscape. With a focus on becoming a destination spot, a public walking path in the form of scales will unite each component. The Aquarium and Marine Research Center are integrated under the same roof for enhanced interaction with the public and with the proposed programs. 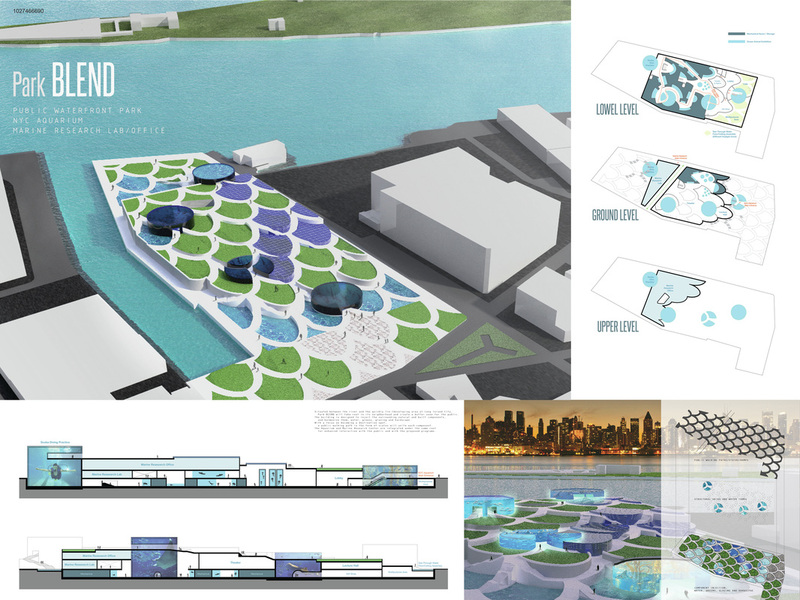 This aquarium is designed around the idea of creating a learning experience along a path through the building teaching about aquatic life from around the globe, as well as water conservation and Hydroponics. A central pathway through my building to leads the aquarium guests as well as the public through different displays throughout. The general public is allowed to enter the building as well as go through the central corridor on the first floor, while the paying guests are required to start their tour on the top floor and then dive down into the larger displays in the bottom level. 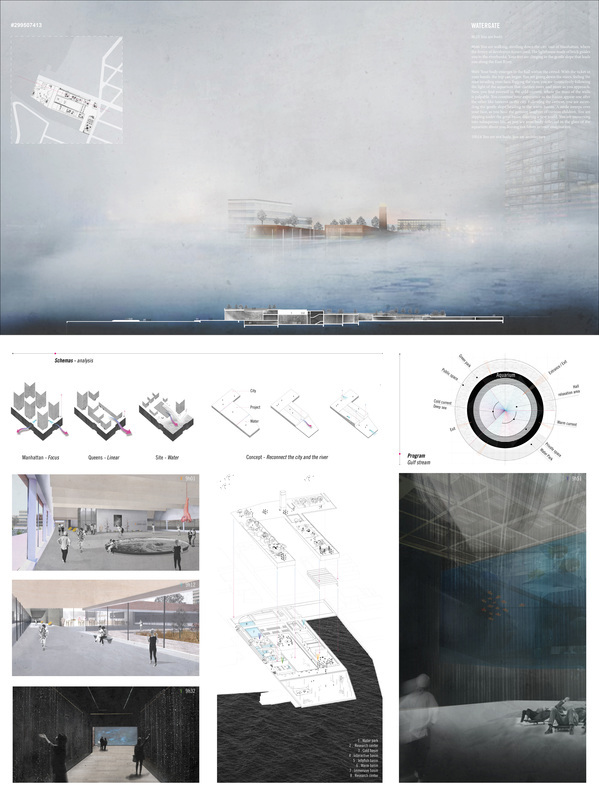 Located in front of Manhattan, Maelstrom does not take a position of rivalry with the skyline but adopts a contemplative posture: visitors become spectators. 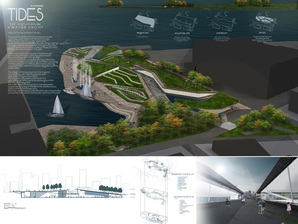 A drop is created to guide the visitor from the Vernon Boulevard to the banks of East River. The visitor passes through a first esplanade leading down to the ground floor of the building; which makes the transition between the street and the bank. 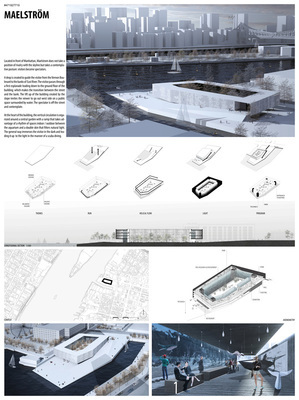 The lift up of the building created by the slope invites the viewer to go out west side on a public space surrounded by water. The spectator is off the street and contemplate. From the depths of the abyss – the great unknown – to the sunlight zone, the oceans contain 99% of the living space on Earth and are responsible for driving weather, regulating temperature and ultimately supporting all living organisms. Water covers more than 70% of Earth, yet we have better maps of the surface of Mars and the moon than we do the bottom of the oceans on our own planet. 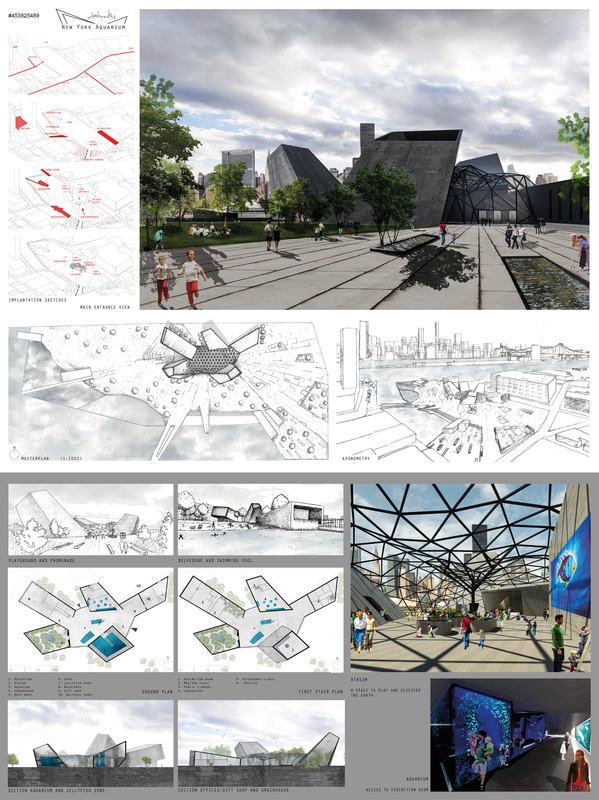 Our aquarium design places scientific research foremost; combining space for laboratories, offices and animal welfare with a unique visitor experience centered around education and learning.